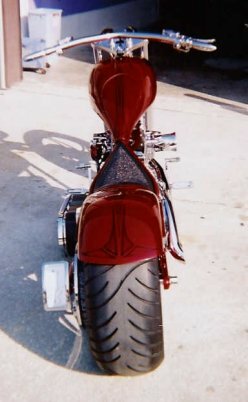 Todd had a cool Fat Boy, which we customized quite a bit... But soon, as often happens he got the custom bug! Acording to him that was 25 years ago, but it was really just 2 (long enuf for any one). We got a Peter Penz frame (Not another one!?#$%@!) and we vowed to build the nicest bike we ever did! 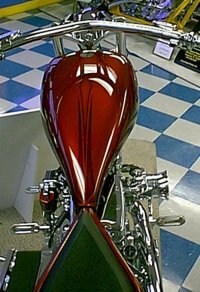 a 100" S&S motor, fully polished was built in-house (oops... see below), a 6 speed revtech, some of the coolest bars you ever saw were designed by us and fabbed by my good friend Mitch Bergeron.... Pro-one wheels, PM Front and GM rear brakes, a Mako Shark seat and the smoothest body work to ever leave this shop. Check out the hole in the rear Strut/Fender to match the wheels, swingarm, bars, etc. etc.... This frame, while hard to build really lends itself to hiding stuff... we put the brake lines, wires, etc In the frame... very little shows!! The Maroon paint over Orange Base and the exceptional molding was laid down by Norbert Dano... It took him 6 of the previously mentioned 25 years, but it came out perfect! We got the sheetmetal and frame back from Norbert a mere 20 days before the Rat's Hole Show... A Tight timetable to do what we needed to make this baby run and stop... We had built the S&S motor 15 Years earlier (ok, 15 months earlier) and with 2 days to go, we fired the motor in the bike for the first time! Fired right up, sounded great, didn't leak... we were stoked (Did I say Stoked??)! Then it stopped! Fired right back up... ran 3 minutes and Stopped!! Thursday noon(Show is 7 AM Saturday) we determined that this dog wouldn't hunt! 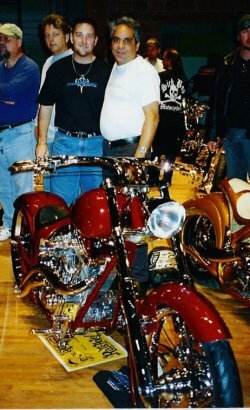 The motor would not make the show.... so from noon til 6:00 in the afternoon, we stripped it out, as we did the motor in 'Blue Diamond', my personal ride, and put that motor in Todd's Bike. Not Bad! 6 hours, 2 motor swaps, polished and riding!!! 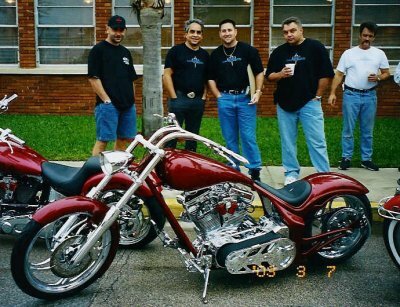 This bike will do some shows before Todd just rides it to the amazement of onlookers!! Above we have what could be considered a small 'MOB'... It's (left to right) Norbert, myself, Todd, Tom and Tommy, waiting for the Rat's Hole show to start. Below is a shot of the proud owner and myself on stage at the world's biggest bike show!! You can't tell he's proud can ya?? ?